"Hi all - I am in need of someone to help with social media outreach. It's a couple of hours a week. Let me know if you are interested." "I will be interviewing Isabel Rimanoczy for a free live online lunch and learn on Aug 24th. Our topic? 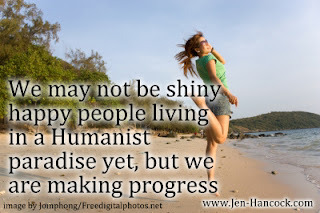 Developing a sustainability mindset"
I promote Humanism for a reason. Hi there - I run an online learning website and a speaker has been making the secular circuit in my neck of the woods talking about a reality based approach to life. I have a serious question. The Vermont National Guard put out a request for sources - for a program that is a LOT like my Living Made Simpler program in terms of topics they want discussed. (see:https://humanistlearning.com/livingmadesimpler1/)? I'm an atheist. Have been since I stopped being agnostic when i was a teen. I went through a 2 week existential depression and realized, ?nope, don't believe and that was that. I literally cannot imagine what it is like to believe in supernaturalism never having experienced that with the exception of some dabbling with a ouiga board while a tween.? HEY, JEN!!!? Where you been Haydn ... or Mozart or any of them classical dudes?!?? It's good to see you here again! I enjoyed you Humanist Thought for 11/8/2011. ?Mentally preparing for the worst-case-scenario sounds morbid at first blush, but is a very good tool for dealing with worry. And since the worst case almost never happens, it helps us see that our lives are, in fact, quite good. just saw the intrview for the book. I have refed my reviews on the vid over at atheist nexus. I am not much for social wab sites actualy. thanx for writing the book. thats more important. P.S.? I'm so jealous that you grew up in a secular household!? Hi Jennifer, thanks for accepting.? I hope you find lots of good ol' atheist friends here. Hello to humanist writer iJennifer. Welcome to Atheist Nexus with its thousands of freethinkers like you. We invite you to join the busy group "ORIGINS: Universe, Astronomy, Life, Earth, Humans, Religion, Atheism, Evolution, Darwin..." with its 340 discussion topics and over 2000 members.